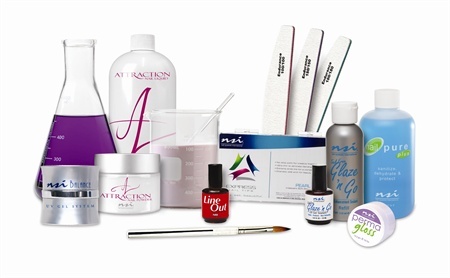 For more than 50 years, the Slack family, owners of NSI and the NSI parent company AMCO, has been at the forefront of researching, developing and manufacturing innovative products with cutting edge ideas for the professional nail care industry. Dr. Fred Slack Jr. was working in a dental laboratory in 1957 when he accidentally cut his thumb nail. Using aluminum foil and dental acrylic, he created a platform to fix the nail, and soon patented the first nail form. The Slack family went on to develop the first non- yellowing, cross-linked formulations used in all traditional acrylic systems today. They continued their tradition as nail industry pioneers by introducing the first fibreglass-reinforced polymers, light-activated liquid and powder acrylic, UV-cured gels, as well as air and heat-activated polish sealants. The company also has the patent on Elation Nail Tips which utilizes Poly Flex TM; a unique material that far exceeds the limits for tip performance. Today, Fred Slack, Director of R&D, and his son Rick Slack, President, lead the company to continually meet the demands for innovative products that are distributed all over the globe. In going the extra mile for quality control, NSI requires batch and tracking numbers on all products. If a nail technician does experience a problem, it can be quickly identified and solved. Mandatory inspection of manufacturing procedures plus many levels of quality control ensure that all NSI products maintain consistency from batch to batch. NSI is committed to the future advancement of nail technology and the ongoing success of nail professionals. We are dedicated to the innovation of thoroughly tested products and progressive research and development. Our steadfast commitment to the highest level of education and our forward thinking approach empowers our most valuable resource; the nail technician. Polish Pro: Not simply a blend of gel and polish, Polish Pro is a fusion of many different raw materials that result in the most resilient natural nail manicure or pedicure. These raw materials include oligomers, monomers, photoinitiators and diluents, among others, all making up what NSI is calling a Poly-Oligomer. This “Poly-Oligomer” is a thin viscosity formula can be applied as easily as polish, while exhibiting some very non-polish characteristics. It is light-cured, eliminating long dry times. The toughness, scratch resistance, flexibility and adhesion of Polish Pro allow the manicure to wear and look like new for a full two weeks. The product is easily removed in 10 minutes by soaking in Acetone and sliding off with an orangewood stick. As for the name? “We called this Polish Pro because we are committed to keeping this line, like all other NSI products, professional-only” says NSI President, Rick Slack. The line is available in an ever-expanding array of colors. Visit www.nsinails.com to view the latest collections. Fred Slack: Before focusing on nail products, Fred Slack III was an innovator and pioneer in the dental industry. He was at the forefront of the development of the first high impact dental crown and bridge materials, the first powder/liquid composite filling material, the first direct bonded orthodontic adhesives, and the first hybrid composite. 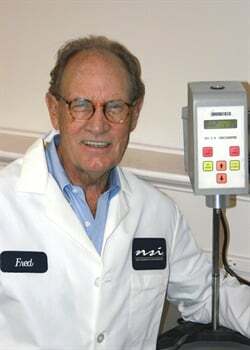 He began working in NSI’s parent company in 1960, started by his father Dr. Fred Slack Jr., which at the time was developing and manufacturing dental products. He used his knowledge of dental technology, acquired at the University of Pennsylvania Dental Laboratory, and worked on the characteristics of acrylic polymer/monomer chemistry with DuPont, Rohm & Haas, and Imperial Chemical of UK, to name a few. When his father retired in 1962, Fred purchased the company. Through his leadership, the company launched many new products in the dental field that would pave the way for nail enhancement technology. He developed the first fiberglass reinforced, tooth colored acrylic materials and the first liquid composite resin with a new composite resin monomer, which led to UV gel chemistry in the nail field. In the early seventies, Fred saw the business potential of professional nail products using acrylic and UV gel technology and he accelerated his R&D work in the cosmetic nail industry. By 1978, he had developed the first EMA-based, color stable, powder and liquid system for nail technicians and began supplying private label nail products to the major players in the professional nail market. After a decade of success as a private development manufacturer, Fred Slack, and his son, Rick Slack decided to take their business to the next level. They agreed to start their own branded company called Nail Systems, later renamed NSI, with their first product being Secrets; the industry’s first odor-free acrylic system. Fred has been behind every new product launch in NSI’s history and while his son has taken over as President, he is still very active in the company as the Director of R&D. 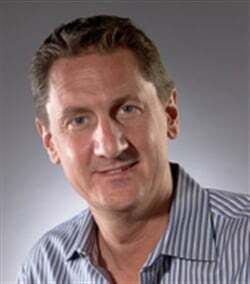 Rick Slack: Rick has over 20 years experience in the professional beauty industry. In 1987, after attending the University of Rhode Island, Rick joined his father to work in the family business which, at that time, was a dental manufacturing company and a developer of private label nail products for the professional nail industry. Rick learned the product development side of the business by working side-by-side with the chief chemist and manufacturing department. As the company grew, he pursued his interest in sales by networking at trade shows and working with dentists, nail technicians and distributors. Rick watched his father develop new nail chemistry for many companies in the beauty industry which led him to suggest the creation a branded line of professional-only nail products. Rick and his father decided to take the plunge and Nail Systems, later to be renamed NSI, was born. While continuing to develop dental and private label nail products, Nail Systems introduced Secrets; the first odorless powder and liquid system. Rick’s focus was now on partnering with distributors around the world to bring the Nail Systems story and nail products to nail technicians. Rick’s focus in the company was not just in sales. He still remained involved in the development of new products. One of the products that Rick collaborated on was fiberglass reinforced nail powders called Choice. Some of the same technology is still used today in the Attraction Acrylic System from NSI. Other products that Rick helped develop are Thermoshield, the first heat-cured polish sealant, and Line Out, the original fill-line eraser, among others. Demonstrating expertise in various areas of the company, it was time for Rick to take the top seat as company President, while his father, Fred Slack, spent more time devoted to R&D. As President, Rick has continued to grow NSI by adding new distributors throughout the world. He never forgets the company mission, which is to further advance nail technology and the ongoing success of the nail technician. This mission affects every decision he makes within the company.